I don’t normally pay much attention to photographing introduced species, but this Rock Dove strutting around in the grounds of Adelaide Zoo caught my eye. It was almost right under my feet, the camera was ready to shoot and the bird was posing appropriately, so I took the photo. 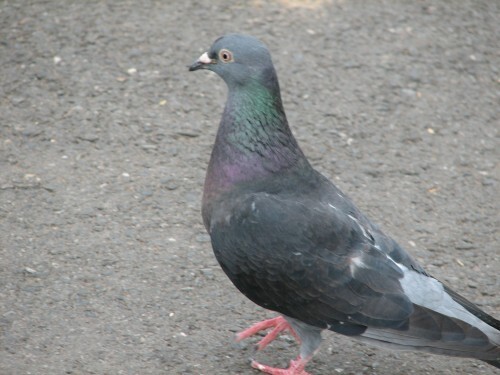 Rock Doves, also called Feral Pigeons, are common throughout Australian cities and towns. They are especially common here in South Australia around cereal grain handling facilities, even in remote rural areas. The free grain available in such places provides a sustainable source of food. When I travelled overseas I discovered that they are very common in most places. 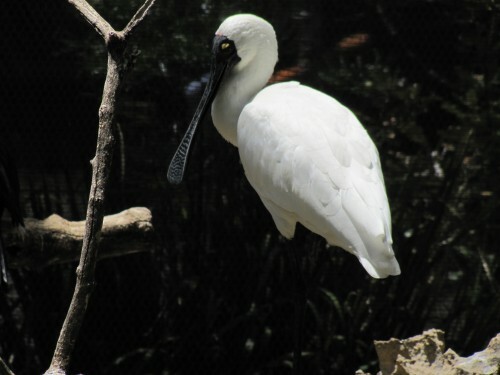 This individual, one of many, was feeding on food dropped by people visiting the zoo. The outdoor restaurant area was only a few metres behind me when I took the shot. I haven’t ventured out much over the last few weeks. It has been a wet winter so far and we’ve have many rain-sodden days. On the days where it hasn’t rained, we’ve either had frequent showers, overcast skies or bitterly cold winds – sometimes all three. The weather has not encouraged anyone to be out in it. Added to my misery of being stuck indoors was the fact that I’ve been very sick over that period. Bronchitis (and several other health issues) has made life even more miserable than it already was. I’m slowly on the mend, and today we had a lovely winter’s day, typical of many days at this time of the year. After a cold night and a near frosty morning, the sun shone brightly all day. I even managed a half hour of reading while sitting in the sun on our back veranda. It was delightful, and I received a good dose of vitamin D as a bonus. I hope it will help the healing process. At one stage I wandered up into our small patch of mallee scrub. Mallee trees are eucalypts and are very common in this part of South Australia. 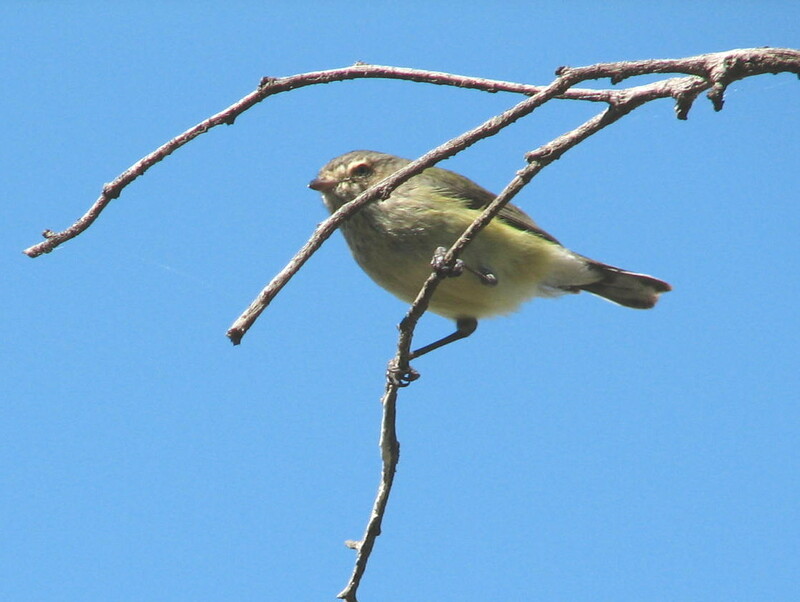 As I slowly walked through the trees a small group of Weebills sat calling sweetly in the branches not two metres above my head. They weren’t at all perplexed by my presence. On our recent trip to Sydney and back I commented several times on the casual nature of the crows along the road. So many times we saw them eating road-kill, either on the road itself, or very close to the edge of the paved area. As we approached – generally driving at 100-110kph – the birds would casually wander off the carriageway and just a few steps out of harm’s way. Rarely did they fly off. Occasionally they might give a hop or two to avoid being hit; this usually meant they had left their escape just a second or two too long. Then after our vehicle had passed, they quickly resumed their feast. I presume that they had learned over their lifetime that vehicles caused them no harm provided they moved out of the way in time. Being quite intelligent animals they probably learned this survival technique from others. It just looked quite comical to me to see them so casually wandering out of danger. I should actually correct myself here: most of the birds we saw were actually Australian Ravens, not crows at all. This is the largest corvid found in Australia. Crows are found further north than where we were travelling. Nearer to home we often see the same behaviour exhibited by the local species, the Little Raven. This behaviour is quite common on the South Eastern Freeway from Adelaide to my home town of Murray Bridge. You are currently browsing the Trevor's Birding blog archives for July, 2013.